Consider a subsonic disturbance moving through a conventional neutral fluid. As is well known, sound waves propagating ahead of the disturbance give advance warning of its arrival, and, thereby, allow the response of the fluid to be both smooth and adiabatic. Now, consider a supersonic distrurbance. In this case, sound waves are unable to propagate ahead of the disturbance, and so there is no advance warning of its arrival, and, consequently, the fluid response is sharp and non-adiabatic. This type of response is generally known as a shock. Let us investigate shocks in MHD fluids. Because information in such fluids is carried via three different waves--namely, fast, or compressional-Alfvén, waves; intermediate, or shear-Alfvén, waves; and slow, or magnetosonic, waves (see Section 7.4)--we might expect MHD fluids to support three different types of shock, corresponding to disturbances traveling faster than each of the aforementioned waves. This is indeed the case. In general, a shock propagating through an MHD fluid produces a significant difference in plasma properties on either side of the shock front. The thickness of the front is determined by a balance between convective and dissipative effects. However, dissipative effects in high temperature plasmas are only comparable to convective effects when the spatial gradients in plasma variables become extremely large. Hence, MHD shocks in such plasmas tend to be extremely narrow, and are well approximated as discontinuous changes in plasma parameters. 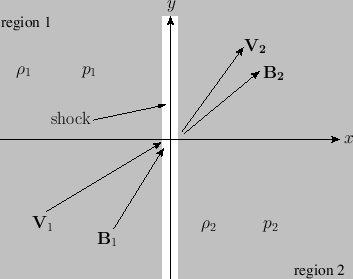 The MHD equations, combined with Maxwell's equations, can be integrated across a shock to give a set of jump conditions that relate plasma properties on each side of the shock front. If the shock is sufficiently narrow then these relations become independent of its detailed structure. Let us derive the jump conditions for a narrow, planar, steady-state, MHD shock. the total energy flux density. Figure 7.11: A planar MHD shock. where . These relations are known as the Rankine-Hugoniot relations for MHD (Boyd and Sanderson 2003). Assuming that all of the upstream plasma parameters are known, there are six unknown parameters in the problem--namely, , , , , , and . These six unknowns are fully determined by the six jump conditions. Unfortunately, the general case is very complicated. So, before tackling it, let us examine a couple of relatively simple special cases.